An award-winning beader, Jane began her beading career on a whim and it has become her passion. She has taken bead embroidery and jewelry making to new heights with her keen sense of color and innovative beading techniques. She is a master bead embroiderer. Jane’s bead embroidery piece, “Old Mexico”, was Judge’s Pick in Jewelry Television’s Designer’s Challenge jewelry making contest in 2013. She has been a four-time finalist in Fire Mountain Gems and Beads beading contests. 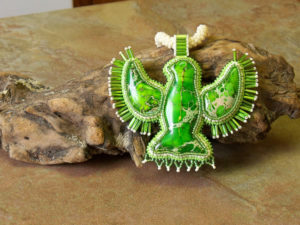 Her work has been highlighted in Fire Mountain Gems and Beads Jewelry Maker’s Comprehensive Catalogs in 2008-2009 and 2012-2013, as well as their Jewelry Maker’s Catalog of Best Sellers 2009-2010. Jane’s work has also been showcased in Richard Stravitz Gallery in Virginia Beach. In 2010, Fire Mountain Gems and Beads hailed Jane as one of the top 10 designers in the country. This unsolicited nomination is decided upon by a jury of peers and is an enormous honor in the beading world. Each of Jane’s pieces is a one-of-kind work of art. 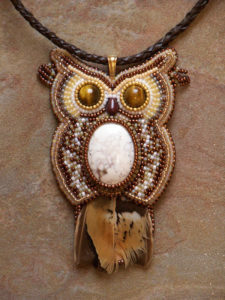 She finds inspiration from nature, animals, flowers, Native American culture, and the beads themselves. Jane has taught a wide variety of beading and jewelry making classes at The Bead Cottage and Virginia Beach Beads in Virginia Beach. Her favorite classes are bead embroidery, stringing, pearl knotting, kumihimo, bead weaving, and her more advanced classes – Basic and Beyond©, Gemstones, and Beading Ethics.